Posted in Bright Ideas / Blog on July 22, 2014. Most of us are aware of the importance that keyword research plays in SEO – whether local or organic. Whilst it’s relatively easy to identify keywords that will drive traffic, the key component is identifying the right keywords that will bring in the right traffic. Some searches are driven by curiosity, others by a specific desire to purchase a service or products. And of course it’s the secondary group that we are most interested in. There are of course plenty of third-party tools to help with local keyword research. If you want to identify search volume for keywords that contain a geo-modifier then some of these tools are useful. Each has it’s merits, some are free, some are paid, and each has various data pool sizes / sources etc. And whilst it’s difficult to definitively qualify which has the most accurate data, one way of doing so is by setting up an AdWords campaign & thereafter judging their accuracy with hard data. However, it is fair to say that we don’t yet have a ‘one size fits all’ local search keyword tool. So in this post we want to explore different methods of carrying out keyword research that is specifically catered for local search. The Google AdWords Keyword Planner tool combines data from the keyword tool & traffic estimator. Both of those previous tools were replaced by the GAKP. It’s important to click on ‘Keyword ideas’ once you’ve gone through to the next page, rather than the default ‘Ad group ideas’. You can easily customise your search by using the left menu, including to “Only show ideas closely related to my search terms”. This is one way to really drill down into what users are searching for in your target areas. One great feature of this tool is that when you’re refining your chosen location, you can use the Advanced targeting tool to clearly see on a map which areas you are targeting. Then with the click of a mouse you can add or remove the surrounding areas. For example, on the screenshot on the right I am able to include or exclude nearby regions into my search at will, selecting Scottsdale and / or Pinal County as well as Phoenix. Using Google Trends you can of course look at interest levels of a particular keyword over a period of time. More useful is the fact that you can drill down into specific locations (see right). As well as a timeline of relative interest, you can click to view news headlines, which might be somewhat interesting for identifying what drives peaks of interest. The forecast option is only available for some queries. 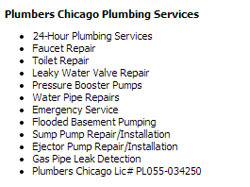 Whilst a forecast may not be useful for plumbing terms for example, it may be more relevant for small businesses that offer services which are influenced by larger events or seasonality. Here you see a breakdown of where your chosen search term is most prevalent (in the area you’re focusing on), with numbers showing where search volume is at it’s highest point on your chosen map (the highest point will always be 100). Another useful feature is the related searches, which show the top queries relating to your search term in your chosen geographical area. ‘Rising’ searches will show you searches that have grown significantly in popularity over a given time period when compared to a preceding time period. For my chosen term ‘plumbing’ this returned the results of ‘Breakout’ – which instead of an actual percentage, means that the search term experienced growth greater than 5000%. Long-tail keywords are of course known for their ability to drive quality traffic with strong conversion potential. For this reason alone, the Google Autocomplete can be very useful. Autocomplete predictions are generated by an algorithm, which in Google’s words, is designed to reflect the diversity of users’ searches and content on the web. Although like any Google algorithm it’s hard to pinpoint exactly what makes it up, we can be fairly confident that historic search volume plays a big part. The ‘suggest’ results are useful for identifying long tail terms. Entering in your main keyword (s) will automatically offer up possible choices. Even in the SERPs we can get more ideas. Take note of the keywords phrased around the meta titles of the search results. 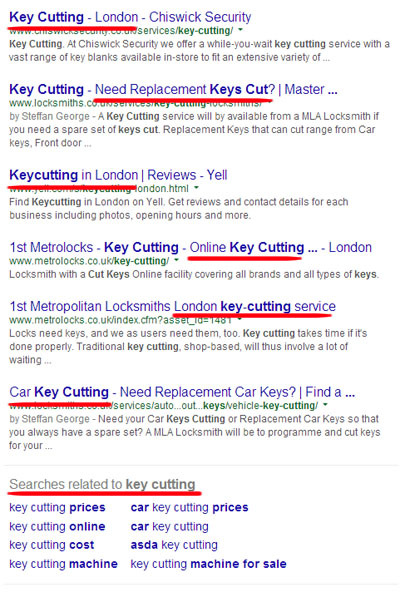 On the example on the right, a search for “Key Cutting” with my location set to London highlights other phrases such as “Key Cutting London”, “Keycutting in London”, “London key-cutting service” & “Car Key Cutting”, which give me further avenues to explore in my research. Google will also highlight “searches related to…” at bottom of the page which provide even more inspiration. Having already touched on meta titles as a source of keyword research / inspiration, another easy method is to analyse your competitors sites. A good way to analyse top performing local competitors is to look at the menus they have on their sites. Look at options they present in their drop-down menus, and see what products they offer. Remember that each product or service is potentially a new keyword to research. Next look at meta-data. We know that meta keywords for SEO benefit are now obsolete, however a lot of sites will still have filled out this info. It’s worth checking the top performing local competitors & seeing if their meta keywords are still in tact. This will supply you with a list of what they consider to be their top terms. Additionally, check what their title & description tags are, as they will again give you an idea of targeted keywords. Blog categories are also a good source of keywords. If a local business has a good performing blog, then they will likely write about subjects they want to rank for. Some quick analysis of their categories, tags & content subjects will again give you a good idea again of what they are targeting.